We were having a family meeting about what to do for Christmas in terms of helping another family. My daughter said "We should do a fundraiser and we can give away the money." All 3 of the kids (ages 9, 13, 14) began talking over each other with ideas. My middle son AJ(13) said "We already have enough stuff, we really don't need more." Kennadie (14) agreed, and said "Dad...you should try doing the Festive500 in 1 day as the fundraiser." (The Festive500, is an annual challenge to complete a total of 500km / 310 miles between an 8 day period. After completing this in 7 days last year, Kennadie began teasing me throughout the year by saying "betcha can't do it in 1 day dad."). Then Danny (9) started crying. I thought well maybe he realized that he was saying that he didn't want any presents for Christmas. But instead he said "I am crying because I am happy. I think it's so cool that we can help other people and it makes me so happy inside that I don't even need more toys." Please help us out in this fundraiser, many hands make light work and you too can help spread some Hope & Joy this Holiday season. For the first group, I will have to tell a story that I have only ever told to those very close to me. This story goes back to me being 2 years old and one of my earliest memories. Unfortunately, it is not a good one. My dad, whom I LOVED unconditionally, and would later become one of my best friends before passing away in 2013, was an alcoholic. He was not a happy drunk. The memory I speak of was of my dad choking my mother in their bedroom. I ran to the other end of the house, and grabbed my toy hammer, then went back to save my mom. I was hitting my dad on the leg, telling him to stop hurting mommy. Unbelievably, he stopped. He stopped just long enough for her to regain consciousness, grab my baby sister, and run out of the house. She didn't have time to get me too, her last words to me as she left the house were "Jeff, RUN!" My dad never hurt me. So although he was angry, he did not direct that towards me. As I mentioned, he and I would become best buds throughout life, which in and of itself is a miracle. My mom was able to eventually come and get me. This is when we left my dad's house and went to a domestic violence shelter. This shelter kept us safe and allowed my mom to get out of a very hostile environment. If it was not for a place like this, I can't even imagine where my sister and I may have ended up. Most likely, we would have been put into the foster care system. This brings us back to why I am starting this GoFundMe to being with. There is a domestic violence shelter here in Pasco County, FL that needs help with funding. The need is great, for printed material, computers, and operational costs. 50% of the funds raised will go directly to this shelter to help the women that are there. Alida has gone through a lot in her very early years of life. She was recently diagnosed with Mycobacterium Avium Complex (MAC) and began monthly appointments with an Infectious Disease Specialist at All Children’s Hospital; appointments that will continue for at least another year. Under medication therapy for MAC, Alida’s health and breathing have improved- but as her parents researched MAC, and with the help of a friend, got in touch with the Non-tuberculous Mycobacteria Foundation (NTMir), they realized that the fight for Alida’s health is not over. There are still many questions that need to be answered in regards to Alida’s rare illness, if she will fully recover and her future health. Since MAC is extremely rare, especially in a baby, there are many more answers that are needed to ensure that she is on the path to health and a full recovery. Although through another GoFundMe that the family posted, funds were raised to help transport Alida to Denver Colorado to see a specialist that is known for their expertise with MAC, the bills have continued to flow in. Even with medical insurance, the Casey family is bearing a very heavy burden. I have personally watched this family take this in stride and not make a big deal about it. I would love to give them some breathing room and lighten their burden, but I cannot do this alone. I do not yet have a second family. I am searching for a family that needs some special help beyond just Christmas gifts. I am accepting "essays" for anyone that might have a family that can use a little bit of extra joy this Christmas season. They can be emailed to philanthrocyclist@gmail.com. My family and I will read these and make a decision on whom to donate to. If you wish to remain anonymous please state that in the letter. So now that you know the Who, I want to share with you the "How" these funds will be shared. I am hopeful that together, we can exceed this goal of $10,000. $250(MAX) or 2.5% - Event cost. If goal is exceeded, the additional funds will be split across recipients 1-4. Although I could write a book on the many reasons why, I think I can sum this up in one word for my entire family: Compassion. 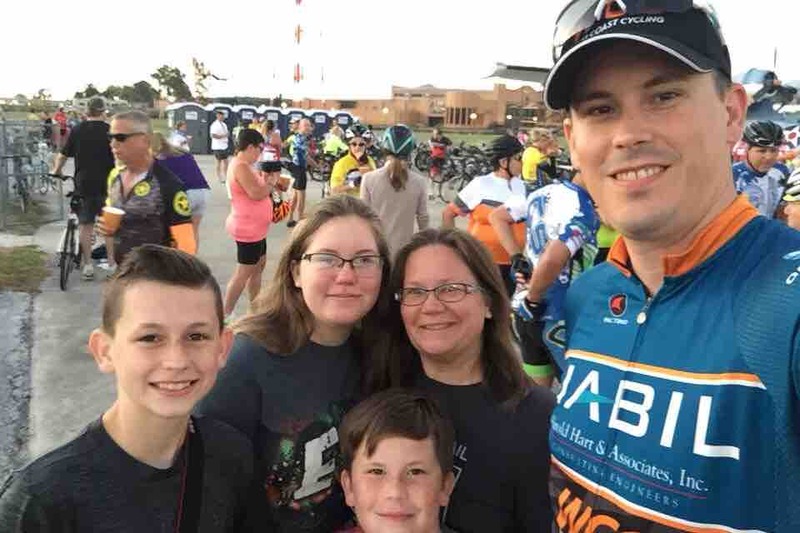 Since my wife and children share this passion for helping others, we decided that as a family we would work as a team to complete this very difficult challenge of crossing Florida 2x on a bicycle as a fundraiser. WOW! A lot has been happening in the past couple of weeks. We've received some very generous donations as you can see by looking at the donor list. I want to thank West Coast Cycling and my Sponsors over there for their support: Jabil, University Bike Center, Vein & Vascular Institute of Tampa Bay, Salon Sassin, and Roman & Gaynor. I wouldn't be where I am today (in 1yr) as a cyclist without this amazing team behind me. Thank you to the folks over I.D. Systems (my employer) for the private donations. You guys are very generous and I am proud to work with/for you. Since this is during the Rapha Racing Festive500 challenge, Rapha (from London) was generous enough to supply some equipment, although not a financial donation it is a very welcomed one. We will be filming on Friday the 14th with FOX13 here in Tampa Bay, to help spread the story. We are very grateful for them running this story. We are hoping that this brings more attention to the reality of Domestic Violence, as well as an increase in donations to help us exceed our goal so we can help even more people. Thank you Kiyel, for being the first to pitch in. I love you man and you are such a great friend! Thank you Michot family for your contribution and your prayers! Lastly, but definitely not least, I want to thank my Wife and 3 children for the key roles that have played in all of this. It was the kids' idea. With my wife supporting me, this has turned from a dinner table conversation, to an incredible outreach into our community, pulling so many different resources together to truly give back. ...it started as a dinner table conversation! It is officially official! I was finally able to touch base with my contact at the Salvation Army so that we could discuss this event as their Domestic Violence Shelter is our primary cause for this event. I am beyond pleased to announce that we are officially working in participation with The Salvation Army and have been authorized to use their Shield in conjunction with the event! I also want to give a public thank you to Mark, Terry, and Chris for their generous donations. Thank You! Thank you for helping us make this possible!!! We've had few offline donation commitments roll in. I also want to thank Kiyel & the Michot family for being the first to jump on board, it means a lot! Please continue to share. This mission was put into action by my 3 kids, and although I am the individual of our family that will be pedaling, I want nothing more than to fan their flames of compassion and for them to see a project come to fruition.